The longest life of any tortoise of which there is an authenticated record is that of Marion’s Tortoise, a Testudo gigantea. This giant tortoise, along with four of its companions, was taken as an adult from its native island in the Seychelles to Mauritius, where no tortoises occur, by the French explorer Marion de Fresne in 1766. It lived there for 152 years, until it died in 1918. Since it was a full-grown adult at the time of its capture in 1766, its actual age may be estimated at not less than 180 years and perhaps as much as 200 years. Even the smaller members of the turtle order are known to be long-lived. 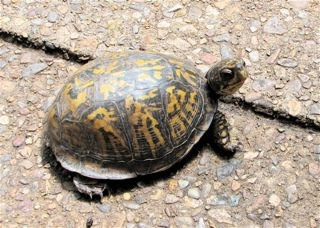 One Box Turtle, passed down as a family pet, is said to have died at the ripe old age of 123. It was just one year older than the person many consider the oldest human on record, a French woman named Jeanne Louise Calment (1875 to 1997). Read the entire article. We have this Box Turtle that lives in our habitat and I never realized that it will be outliving both of us. That's quite amazing! Their roaming range is only about 600 feet so I guess he'll be around for quite some time. Kinda nice to think about that.